With seven of the high street’s most exciting fashion brands - Burton, Dorothy Perkins, Evans, Miss Selfridge, Topman, Topshop and Wallis plus shopping concept Outfit to choose from, Arcadia Group Gift Cards are without doubt the most stylish way to select a gift or reward. Arcadia brands all offer their own distinctive take on fashion and cover the market, so there’s no need to look any further. Arcadia Gift Cards can be redeemed in any one of 2,500 stores in the UK and Ireland, providing your people with the flexibility to choose where and when they want to shop. Choosing Arcadia Group Gift Cards comes with the confidence that your reward will say it in style. 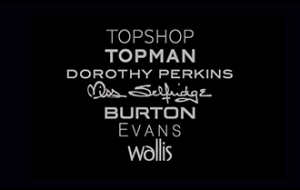 Arcadia Digital Gift Card can be redeemed instore with manual key entry at tillpoint In Arcadia brands; Burton, Dorothy Perkins, Evans, Miss Selfridge, Outfit, Topshop, Topman and Wallis. Arcadia Digital Gift Card can be redeemed online entering 16-digit card number and 4-digit pin at checkout. The Arcadia e-gift card can only be redeemed in participating Burton Menswear, Evans, Dorothy Perkins, Miss Selfridge, Outfit, Wallis, Topshop and Topman (“Arcadia Brands”) stores in the UK and the Arcadia Brands’ pound sterling websites. It cannot be used in Arcadia Brands’ concessions in department stores. When redeeming your e-gift card online, you will need to input the (16 digit) card number and the (4 digit) PIN code at the payment page of the online checkout. Up to five e-gift cards can be used on one order. If you do not have enough funds on your gift card to cover the total cost of your order (including delivery), you can split payment between an e-gift card and another payment method. When redeeming your e-gift card by visiting one of the Arcadia Brand’s stores in the UK, you will simply need to either present your e-gift card in a printed format at the till point or present the electronic version of the e-gift card on your mobile device to the cashier at the till point. If you use the e-gift card as split payment for a purchase (part e-gift card, part debit/credit card or cash) and you subsequently return the purchase, the e-gift card will be refunded first and the remaining balance will be refunded to the other method of payment originally used. The e-gift card cannot be refunded, exchanged for cash, used to purchase Arcadia Brands' gift cards or e-gift cards or used to settle Arcadia Account Card balances. Any balance remaining after use of the e-gift may be applied to future purchases. E-gift cards can only be redeemed in the currency in which they are loaded. The e-gift card is valid for 24 months from date of purchase, after that time any balance remaining will be deducted to nil and forfeited. Please treat this e-gift card cash. Register your e-gift card at www.arcadiagroup.co.uk to protect the card against loss or theft. Arcadia is unable to replace e-gift cards(s) if damaged, lost, intercepted or stolen.